Knowing the most relevant things you could be doing at any given moment helps you make the best use of your time. This section will teach you how to filter, search, and use the Focus list to see just what you need. You'll also learn about your view options and the Focus email. Filtering allows you to narrow your lists down to the most relevant items using assigned tags and attributes. Try the steps below for on-the-fly filters (which are set until you view a new list or clear these filters). For more permanent filters, take a look at global area filtering. If you’re looking to exclude specific words or tags from your view, learn about search. This video also gives an overview of different ways to target the actions you need to see. Choose a list or perform a search. Tap the 3 dots in the top-right corner, followed by Filters. Select your desired attributes or tags, repeating as necessary. Select your desired tags and attributes from the list near the top of the screen. Hold Ctrl or Cmd and click to select multiple tags. Good to know: The more filters you select, the more specific your view will be. You will only see items that match all of your filters (rather than any one of them). Using the mobile app, open the left navigation menu, tap Tags, and make your selection. To see everything in the selected area, press the spacebar within the search bar. Using the web app, scroll down to the Tags section near the bottom of the side nav and click your selected tag. The All tag will show you everything within the current area. The blank tag will show you everything without any tags except the area. Good to know: This type of filtering uses one tag at a time. If you want to filter these results using additional tags or attributes, use the steps above for filtering items within a single list. Similarly to filtering within a list, once you change the view, the filter will be reset. Areas are similar to other types of tags in that you can assign them to items, manage them, and filter items with them in the same way. They’re unique because they let you change your whole view with Global area filtering. When you do this, the entire app (except for the Inbox) shows items specific to that area. In the web app, the list of areas is located in the top left corner of the screen, next to Nirvana. Select an area and you’re ready to go. You can also use Shift + the number associated with an area to change your view. Just take a look at the area drop-down menu to see which number corresponds to each area. In the mobile app, the list of areas is just under the name of the current list. Simply choose an area and you’re set. Unassigned items: If an item has no area tags, it’s considered unassigned. If you set your preferences to include unassigned items, you’ll see these regardless of the area selected. You can change this in your settings. Using the web app, choose All Areas and choose the area from the tag list at the top of the window. Using the mobile app, choose All Areas, click the 3 dots in the top-right of the screen and choose Filters. From here, you can click Tags and filter by area. Good to know: Since Focus is a flag, not an action state, you’ll see focused Inbox items in all of your areas’ Focus lists. If you want to find a specific item, it’s probably quicker to do a search than to rely on filters. On the web app, the search field is located near the top of the window. Just click Search or press tab and begin typing. On the mobile app, the search field is located in the top Navigation Bar. Just click the magnifying glass to enter your search. Once you start typing, Nirvana will display all actions, projects, reference lists, and reference items that contain matching results (and are not in the logbook or trash). 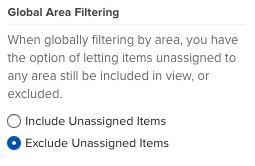 Good to know: If you don’t find an item using search, there’s a good chance it’s in a different area than what you’re using as a global filter. Try changing the view to All areas to make sure you’re searching all of your items. You can filter your search results by due date , energy , time , or tags. In the web app, these filters are available just under the top navigation bar. In the mobile app, tap the 3 dots in the top right of the screen and select the desired criteria. Take a look at this article for more information on filtering. In the web app, adding a minus sign before a word or tag will remove it from the search results. For example, if you want to find all items that have the tag “Read” and the word “review”, but don’t have the word “Math”, nor the tag “School”, type “Read review -Math -School”. If you know that what you need is in a certain list, or that a regular search will yield too many results, you can restrict your search. We’ve removed Logbook items from the regular search results to help speed things up, but you can still search them if needed. Using the web app, start the search with “in:logbook” followed by your search term. For example, you might type: “in:logbook report” to see matching logbook results. Good to know: The logbook shows the last 90 days of completed and collected tasks on desktop for Pro users, the last 30 days for free users, and the last 14 days on mobile. If you’d like to see more of your history, you can learn how to export your data. Focusing items can help you highlight things that need your attention now. They get a star and they appear in the Focus list, which you can have emailed to you daily. You can manually focus any item by clicking the star icon next to it. If you’re using the web app, you can also drag items to your Focus list or use Rapid Entry to create a focused item. You can automatically focus an action or project by scheduling a start date or due date for the item. When the date arrives, it will appear in your Focus list. Good to know: Starring an item doesn’t move it. The Focus list shows your starred items in one place, but the items still exist in their original locations. Scroll down to Focus via Email. Click Change Days of the Week and make your selections. Good to know: We’ll send your Focus list to the email address you use to login, so keep an eye out for it there. Click the icon at the top of the list to fully expand your notes; the icon to partially expand notes; and the icon to collapse them. You can also click the notes icon next to the item title to toggle between expanded and collapsed notes for a single item. Tap the 3 dots at the top-right of any list and select Display Options. From the panel that appears, choose whether to show or hide your notes. Good to know: To see a truncated view of your notes in lists, enable Collapse Notes from your settings. To see your notes in full within lists, disable this setting. Change the density of the information to Compact or Comfortable in settings, under Look & Feel. Resize the side navigation with the arrow that appears when you hover your mouse between it and the main screen. Decide to show or hide effort and tags by tapping the 3 dots at the top-right of the list, then tapping Display Options. From the panel that appears, choose what to show or hide. Go into the Projects or References list and click on the three dots icon at the top of the page. From here, you can choose your sorting option. Enter the Projects or References list and tap the 3 dots in the top-right corner of the screen. Select Display Options and choose how to sort the list. Unified List: This shows your Next standalone actions, all incomplete Next actions from active parallel projects, and the first incomplete Next Up action of your active sequential projects in one group. Group by Project: This shows your Next standalone actions followed by groups of active projects containing their incomplete Next actions. Sequential Next Action: This shows a list of your Next standalone actions as one group, followed by a group of the next incomplete action of your active projects. Good to know: If the Next Up action for a sequential project is a Waitingfor or Scheduled action whose start date hasn’t arrived, it will not appear in the Unified List View. In the Group by Project and Sequential Next Action views, you’ll see the action after it. Unified: This shows a list of all Focus items organized into one group. Group by project: This shows a list of all Focus items grouped by standalone actions, then focused projects, then focused actions within their projects, then reference lists and items. Group by state: This shows a list of all Focus items grouped by their action state, followed by a group of Active projects and a group of Reference lists and items. Print and export your data to connect with the outside world.